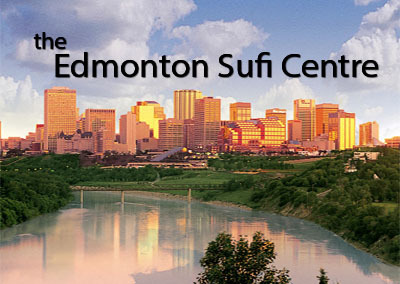 In the late 1970's a Sufi group was formed by a number of people living in Edmonton, Alberta, Canada. Shamcher Bryn Beorse, a student and friend of Hazrat Inayat Khan, was the inspiring teacher and friend of these fledgling sufis. 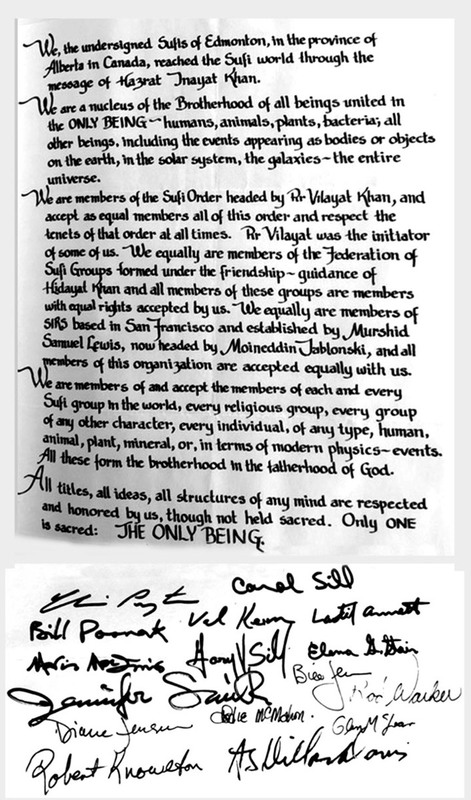 Shamcher drafted the letter below as a declaration of the values and ideals he shared with this group of Sufis. Today it still has resonance and some of those who signed are still active in the work of spreading the Sufi Message of Inayat Khan. In the late 1970’s, a group of young people living in Alberta, Canada were introduced to the philosophy of Hazrat Inayat Khan, a spiritual teacher who travelled from India to the West in 1910. He spread what he called the Sufi Message, first through his music, then through lectures and writing. Sufia Carol Sill had written to Shamcher Bryn Beorse, a student of Inayat Khan, who lived in Washington state. Their deep connection informed and focused the weekly meetings held in Edmonton and Calgary and a Sufi community reflecting the ideals of Inayat Khan Sufism began to develop. Either we are all Sufis or nobody is, exclaimed Murshid Hidayat on many occasions. The ideals of Love, Harmony and Beauty, Spiritual Liberty, and Universal Sisterhood/Brotherhood are brought into the "real" world by holding those ideals in one’s heart but also by supporting their outward expression. One's beliefs and practices can bring about change. When shared with others the change has potential to be much more far-reaching. Everyone with sympathy for the expression of the Sufi Message is a worker for the Message. Our lives are made more complete by trying to make life better for others through sharing the spiritually we have found. 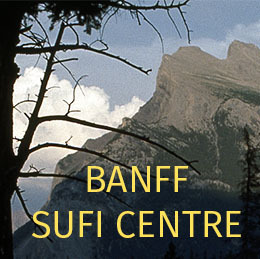 Each year The Sufi In Canada (SIC) offers weekly meetings, workshops, email communications and a website. We invite you to join us in sharing the Sufi message in our times. 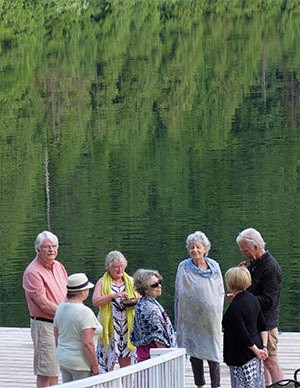 image: "Morning Breathing Practice, Loon Lake Retreat"
Sufi Circle Canada has created an ongoing project to restore the audio and video recordings made at various times and places, but especially media created from the annual Rocky Mountain Sufi Camp. This event ran from 1982 to 2002 and produced a tremendous amount of material. Of course it is not possible to present here the hundreds of images and hours of audio and video that are available. The material chosen is done with an intention of illuminating the 'who and what' of this Canadian Sufi community. 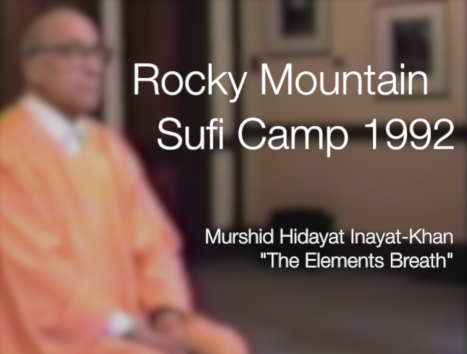 An excerpt from the June 14, 1992 Rocky Mountain Sufi Camp held in the lodge at Lake O'Hara, Canada. Murshid Hidayat guides the participants through the Elements Breathing practice. Click the image to view the video page.